Once upon a time I used to go to the fridge, grab last night's leftovers and pop the container in the microwave. Maybe you did, too, before we all knew that toxins from plastic are likely leaching into our food. I would blissfully, ignorantly eat my lunch from the same container I heated it in, chemicals and all. Nowadays, though, I just trash the environment by dirtying more dishes. I take the food out of the container and put it on a stoneware plate. After lunch I load storage dishes and eating dishes into the dishwasher. Surely there's got to be a better way. Thanks to Ziploc, there is. And to show a bunch of us Denver bloggers its new VersaGlass, the Ziploc people, with the help of hostess Anne-Marie Nichols, hosted a fun evening of cooking at Cook Street School of Fine Cooking. And to top it all off, the Ziploc folks are giving away a gift bag to one of YOU. If you would like a chance to win leave a comment below by June 1 (US, only, please). In your comment, please tell a brief tale from your kitchen -- good or bad, you choose. Random.org will select the winner, make sure I am able to reach you. It's not a requirement for your entry, but we'd appreciate it if you'd Like Ziploc on Facebook and tweet or share this post. **Updated **: Random.org selected #8, so AreYouKiddingMe, come on down! I'll be contacting you about shipping your winnings. Congrats to you and thanks to all who entered! I love to cook, and I'm totally guilty of eating my leftovers in the container I heated it in. A tale from my kitchen would NOT be brief! How about the time we baked rice crispy bars in the oven? We experiment a lot with food and the whole family gets involved in cooking fun--- of course, sometimes experiments go awry so we need containers and the right tools... to wrap up the things that make it :-) Ha! I'd love to win these... sounds like you guys had a blast! I think some of my funniest kitchen tales come from when I was pregnant (cause logic and common sense flew out the window). There was the time (of course, while pregnant) that I decided I HAD to make an apple pie at 9 at night. It was gorgeous and smelled so good...but, it was completely inedible because I forgot to put in the sugar. WANT these. I've been looking for tempered glass containers I can use for freezing and reheating (especially freezing, since I just got an ice cream maker for my birthday!). hmm, tale from my kitchen? our daughter now shouts out all the ingredients for our morning smoothies as we make them. ever hear a 2yo yell "protein!" or "flax!" or "vitamins!"? me neither, until now. I learned today that toxins are produced by living cells while toxicants are man-made. (http://www.sciencebasedmedicine.org/index.php/science-and-medicine/fashionable-toxins/) Seems to be today's theme, I guess. Kitchen stories...well, my most memorable was the time I learned that our oven thermometer no longer worked. I was trying to make cupcakes, but ended up with hockey pucks. Seemed a little hotter than normal when I put them in, but at 13, I didn't have enough experience to judge it properly. These look really cool! Oddly enough, we joke that our fridge is where leftovers go to die. It's tall and black and shaped like a coffin... Ha. We always have leftovers in our home, my husband cooks so much food. My fridge overflows with plastic containers. I would love one day to replace them all with chemical free ones. I would love to win too! 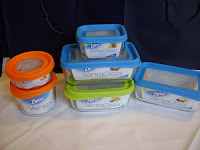 We eat a lot of leftovers in our house and can always use more storage containers, especially ones that are made well. The cutting boards/mats look awesome too. I cut a lot of fresh fruit and veges in my kitchen and would enjoy those. Story from my kitchen... On numerous occasions I have been trying to steam veges over the stove and was multi-tasking too much and forgot to put water in the pot, which in turn got burned when I turned on the burner. Oops! We used to divide the labor that I did the cooking and my husband (then boyfriend) did the dishes. He left the dishes so long that a pan rusted through. I picked it up, looked at him through the six inch hole in the pan, and lectured him that the pan cost a lot of money and he needed to do the dishes every day. Kitchen stories ... The one where the refrigerator door feel off in my hand on Thanksgiving morning? Or when the turkey fryer turned into a turkey fire? Or how about when the 3:00 no-fail standing rib roast turned into grilled rib-eyes? I spilled water on the birthday cookies and had to bake another batch (and eat the dry edges off of the first batch)? Or when I cleaned out the refrigerator so that the huge pans of lasagna I had made for my in-laws-to-be, only to discover 18 hours later that I left the fridge off, had to dump the lasagna, and start over without the luxury of the spices meshing over 24 hours? How about when the dog ate the rack ribs, right off the counter? Did I miss anything, Lori? @Tami, how did I manage to miss most of those?? In high school my mom had this black plastic pan made for steaming thing in the microwave. One day I pulled it out and without thinking I tried to use it on the gas stove top to make something. I melted it. In my defense it looked like a sauce pan. In the plastic pans defense - I obviously wasn't thinking.